Los Altos, CA; Paris, France - January 25, 2010. 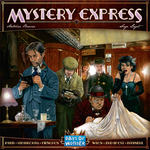 Days of Wonder announces Mystery Express, an imaginative new take on the classic deduction game from Antoine Bauza & Serge Laget. While Days of Wonder's first "whodunit" game, 2003's Mystery of the Abbey, was considerably more quirky and chaotic, Mystery Express explores the more analytical side of the genre, rewarding a logical and more precise approach to solving the crime. Players board the famous Orient Express in Paris just as a murder occurs. The rest of the trip - through Strasbourg, Munich, Vienna, Budapest and their final destination of Istanbul - is consumed with determining the who, what, when, where and why of the crime. Players use their special powers of deduction; information gleaned from others in various train cars; and investigative actions to determine the exact circumstances of the murder. The one who correctly identifies the most elements of the crime by the time the train reaches Istanbul wins the game. Mystery Express is a classic Days of Wonder design made up of top-notch components and unique, period-perfect illustrations. Along with the Mystery Express board map detailing its itinerary from Paris to Istanbul the game features: 5 resin character figures and matching character tokens; 5 Ticket wallets that include a description of each character's special power; 100 Deduction sheets that players use to keep track of their deductions; 72 Crime cards; a Mystery Express miniature train to track the Mystery Express's journey on the map; a Conductor figure; 2 small passenger tokens, a miniature travel bag, a train whistle and rules booklet. Mystery Express is for 3-5 players and will be available worldwide in April 2010. Price is $50/€45.